Owls have been in fashion for a couple of years now (especially on Etsy shops) but I never got to make any of my own. I thought I would not bring anything new to the current owl frenzy. But I somehow surrendered to an owl-making-urge that got hold of me a couple of weeks ago. I made felt and burlap owl ornaments in Christmas tree compatible size. These little guys are for sale in my Etsy shop. I also printed an owl design on cotton canvas and made decorative cushions out of it. This turquoise bird is also for sale on my Etsy shop. 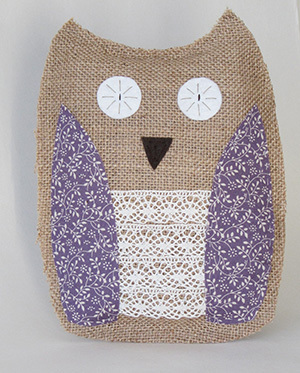 Latest addition to my owl family is a medium size burlap owl. It is a larger replica of the Christmas ornament. The last one, other owls and more of my makes will be available at the Chocolate Factory Christmas Fair on Saturday 15th December. I will hold a stall there from 12.00 to 7.00 pm, and I would love to meet you there. I can’t wait to show my creations and chat with people about the festive season, I’m such a Christmas Fairy! Soo cute – you should have jumped on the wagon ages ago. I love the way you photograph your makes too.